A comfortable resting place for rabbits and other small pets, made from naturally dried grass, edible. 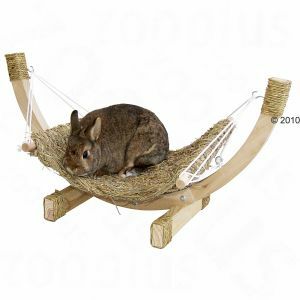 It´s every bunny´s dream - hanging out in the comfy grass hammock and having a nibble at the same time! Grass Hammock SIESTA is the perfect spot for sleeping dozing and relaxing. The natural hay is completely edible for your peace of mind. The set includes a cosy hammock and a robust wooden frame. If your pet prefers less swing the hammock can be fixed to the frame with a hook. Installation is quick and easy. The grass mat is free from dangerous wire and plastic parts and entirely edible.